Jetsun Rinpoche Dragpa Gyaltsen, the third of the five founders of the Sakya Order, was born in the year of the Female Fire Rabbit, (1147) in Sakya, Tibet. His father was Sachen Kunga Nyingpo, the first founder of the Sakya Order. His mother’s name was Machig Odron. His older brother was Loppon Sonam Tsemo, who was the second founder of the Sakya Order. When Jetsun Dragpa Gyaltsen entered the womb, his mother had a very special dream in which a naga king approached her and requested accommodation. The birth was accompanied by many auspicious omens. As an infant, even when barely able to talk, he delighted in staying in isolated places and in studying. He was not attached to mundane concerns such as food and clothing. Although still young, he was completely beyond childish things. Jetsun Dragpa Gyaltsen received the brahmacarya upasaka vows from the Bodhisattva Dawa Gyaltsen at the age of eight, and from that time onward, he maintained the vows with great care. His purity in maintaining vows was greater than some fully ordained monks of that period, and, in fact, he strongly desired to receive full ordination. He always urged his fully ordained disciples to perform the sojong practice to purify and renew their vows. During the sojong ceremony, he took pleasure in personally offering tea to the monks. Even on special occasions such as tsog offerings, he carefully avoided all meat and alcohol. However, later in life, he began to accept more tsog offering substances than he had before. When asked why he now accepted more, he responded, “Earlier, I had such strong desire to drink chang that I even dreamed of it, but because I recognized this as Mara’s attempt to hinder me, I would take very little. But now I have no desire at all. Therefore, I accept more.” Throughout his entire life, meat and alcohol never touched his lips except on these special occasions. 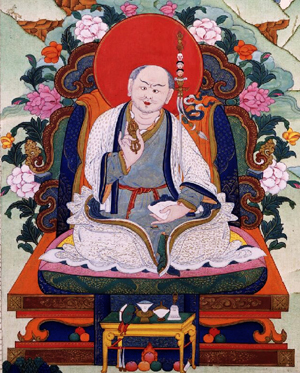 At the age of ten, Jetsun Dragpa Gyaltsen received the instructions on Candragomin’s Twenty Verses on the Bodhisattva Vow as well as instructions on the Hevajra sadhana according to the Padmavajra tradition. Then, at the age of eleven, he taught these to other disciples and everyone was amazed at the profound understanding demonstrated by his explanation. He was given the name Lodu Chenbo, which means Great Intelligence. One night when he was twelve, Jetsun Dragpa Gyaltsen dreamed that he swallowed the three Hevajra tantras, and experience arose in which he attained realization of the suchness of all phenomena. When his father, Sachen Kunga Nyingpo, passed away, Jetsun Dragpa Gyaltsen assembled a large gathering of disciples and taught a commentary on the Hevajra Root Tantra. All were astounded to hear such a wonderful and profound teaching from someone so young. When Jetsun Dragpa Gyaltsen was thirteen, his elder brother Loppon Sonam Tsemo left for central Tibet to further his Dharma education. From that time, until the age of 70, Jetsun Dragpa Gyaltsen was responsible for Vajrayana teaching at the Sakya Monastery. However, his guru had forbidden him to teach the Lam Dre for nine more years, and thirteen years actually passed before he gave that teaching. During that period, he received many teachings from various teachers including Loppon Sonam Tsemo, Nyen Tsuktor Gyalpo, Shang Tsultrim Drak, Nyak Wangyal, Dzaya Sena from Nepal, Tarma Yondun Lotsawa, and Palchok Tangpo Dorje the Sumpa Lotsawa. From these teachers, he received the full commentaries on the Hevajra Root Tantra, and the Common and Uncommon Commentary Tantras, including the sadhanas and several different traditions of explanations. He received the entire explanation of the Chakrasamvara Root Tantra, including the supplementary texts; the explanations on the three Guhyasamaja Tantras of the Arya tradition with all the supplementary texts, and the explanation on the Guhyasamaja Tantra including the pith instructions according to the tradition of Yeshe Shap and Dzayen. Particularly, he received the pith instructions according to Yeshe Shap and Men Shap. He received the reading transmissions of all of these texts and all the other requirements. From the yoga tantra tradition, he received the explanation on Sahaja-samaja known as Luminosity of Suchness, as well as the explanations of Vajrasisara, the Shriparamadhya Tantra, the Durgatiparishodhana Tantra, and many others, including explanations of all their supplementary texts. He also received the explanation of the Three Tantras of Yamari including the supplementary texts, and many related pith instructions; a commentary on the Manjushri Namasamgita, including supplementary texts; explanations on the charya tantra; the explanation of Arya Acala known as Great Concept; and many other texts. From the kiriya tantra tradition he received many instructions and explanations such as the Guhyasamaja Tantra, the Vahubhadra Tantra, and others. 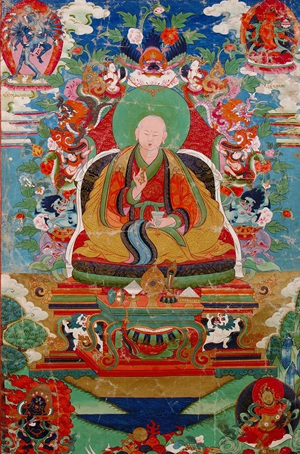 Jetsun Dragpa Gyaltsen received many other Dharma teachings concerning the sutras and the history of Buddhism. He learned all of the teachings that he received thoroughly and comprehensively. Immediately after receiving the teachings, he memorized the texts, never postponing or procrastinating in his studies. Jetsun Dragpa Gyaltsen exerted himself greatly in his daily practice of meditation and recitation of sadhanas. Each day, he spent until midnight in meditation. Then he arose early, even in winter, dressed in his Dharma robes, washed his face with cold water, and performed his meditations. When Jetsun Dragpa Gyaltsen went to the monastery to teach, he performed the Hevajra sadhana on the way, and when he sat upon the Dharma throne, he took consecration and sealed his practice with the master of the race. At the end of the teaching, he performed the torma ritual, and used the Dharma teaching as the recitation of mantra. As he left the monastery, he would begin another sadhana, such as Chakrasamvara. In this way, each 24 hours, he performed the mandalas of almost 70 deities. His attendants said that they never saw his body, voice, or mind relaxing in an ordinary manner. At all times, he was constantly engaged in meditation, reading of texts, or the turning of the wheel of Dharma. Jetsun Dragpa Gyaltsen devoted his entire life to teaching, and his explanations were easy for disciples to understand. He explained even difficult topics simply and clearly. Jetsun Dragpa Gyaltsen responded to all questions and challenges without difficulty, providing explanations according to scriptures and using his own knowledge. His teachings were always in accord with the authentic Dharma, and he dispelled the misunderstandings of other beings. Jetsun Dragpa Gyaltsen was an extremely prolific writer and wrote many original works, all of which were elegantly composed. A few of the most famous are listed here. A full listing covering several pages is contained in the complete biography by Sakyapa Ngawang Kunga Sodnam. Among Jetsun Dragpa Gyaltsen’s compositions on anutara yoga tantra are: Supplication to the Lam Dre Lineage Lamas; a commentary on the last two chapters of the Hevajra Root Tantra known as Accurate; an explanation of what is to be realized through the tantra known as Wish-Fulfilling Tree; Explanation of 113 Sections of Tantra; Outline of Donton; Holy Biography of Sachen Kunga Nyingpo; Verses from the Holy Biography of Loppon Sonam Tsemo; Six-Limbed Hevajra Practice; Commentary on the Fifty Types of Guru Devotion; an explanation of the Vajrayana root downfalls known as Dispelling Errors, Explanation on Vajrayogini’s Behavior; and Brief Outline of Vajrayogini’s Behavior. Among his many compositions on kiriya, charya, and yoga tantra are: General Explanation of Charya Tantra; Outline of Charya Tantra; the Sarvavidhya Vairochana ritual and supplementary practices known as Rays of Light Benefiting Beings; Text for Reciting the Manjushri Namasamgita; Outline of the Explanation of the Various Activities of the Twenty-One Taras; Brief Form of the Four-Mandala Green Tara Ritual; and Elaborate Form of the Four-Mandala Green Tara Ritual. Among his other compositions are Explanation of the Lineage of the Shakya Clan; Brief History of the Early Rulers of Tibet; Explanation of How Buddhism Divided into Various Schools in India and Tibet; Explanation of Astrology’s Origins; Commentary on the Twenty Vows; Outline for the Guide to the Bodhisattva’s Way of Life; a collection of various religious songs, and an explanation of Tibetan medicine and diagnosis known as King’s Treasury. Jetsun Dragpa Gyaltsen composed these and many other works. The main focus of his writings was not elegant discourse, but rather the benefit of beings. Therefore his compositions are easy to read and understand, and suitable for both the learned and unlearned. All are delightful to read. Jetsun Dragpa Gyaltsen was also skilled in sacred drawing, and drew various protection chakras, mandalas, and other works, which he sent to his disciple Nyakma. Many amazing stories describe Jetsun Dragpa Gyaltsen’s spiritual power. In India there lived a meditator who practiced Yamantaka, and had gained realization through clear visualization and the creation process. Yet he lacked altruistic thought and the completion process. After he passed away, he was reborn as a powerful spirit with nine goiters, in place of Yamantaka’s nine heads. When the Kashmiri Pandita Shakya Shri Badhra visited Tibet, the spirit followed him, and none could make it go away. When Shakra Shri Badhra visited Sakya, Jetsun Dragpa Gyaltsen welcomed the great pandita. Realizing that the evil spirit was following the pandita, Jetsun Dragpa Gyaltsen placed his vajra and bell in space and expelled the spirit. As the spirit was disinclined to return to India, it went instead to the east, where to this day it follows those who travel with a great deal of wealth, and attempts to re-enter Tibet. Another time, when Jetsun Dragpa Gyaltsen was meditating in the retreat cabin known as Zimchel Karpo, Shakya Shri Badhra asked Sakya Pandita, “Where is your uncle?” Sakya Pandita replied that he was meditating. Shakya Shri Badhra asked to see him, and Sakya Pandita said that he would go to announce Shakya Shri Badhra’s arrival. But Shakya Shri Badhra asked instead that they go together to Jetsun Dragpa Gyaltsen’s room unannounced. When they suddenly appeared in the door of the retreat cabin, Jetsun Dragpa Gyaltsen had just completed the Guhyasamaja self creation, and was making offering and homage to the front creation. Meaning to perform prostrations to Shakya Shri Badhra, Jetsun Dragpa Gyaltsen stood up suddenly and tried to place his vajra and bell on the table. However, in his haste, he placed them in the air, and they remained there in space, without falling. Shakya Shri Badhra said, “This is an amazing sign of your realization.” But Jetsun Dragpa Gyaltsen replied, “I did not do this to impress you,” and performed prostrations to Shakya Shri Badhra. Shakya Shri Badhra returned the prostrations with his own prostrations. Shakya Shri Badhra’s attendants, the lesser panditas, felt uncomfortable, as they had previously requested Shakya Shri Badhra not to do prostrations to Jetsun Dragpa Gyaltsen, as he was an upasika vow holder while Shakya Shri Badhra was a fully ordained monk. The lesser panditas asked Shakya Shri Badhra why he had not honored the agreement, and Shakya Shri Badhra said, “Despite our agreement, Jetsun Dragpa Gyaltsen is the real Vajradhara,” and explained that he had perceived Jetsun Dragpa Gyaltsen to be dwelling within the complete Guhyasamaja mandala. Another story illustrates Jetsun Dragpa Gyaltsen’s good qualities. Once Jetsun Dragpa Gyaltsen performed a retreat to the north of Sakya in two inter-connected caves with a skylight. On the full moon of the eighth month, his attendant saw many people arrive on horseback. They all dismounted and entered the cave. The attendant thought that the cave was too small to hold them all, but when he peeked through the opening, he saw that the cave easily held a great many people, who all spoke a language he had never heard before. The visitors made prostrations and requests to Jetsun Dragpa Gyaltsen, and their discussions were translated by an eight- or nine-year-old boy, wearing a white robe and a turquoise crown. After a while, Jetsun Dragpa Gyaltsen asked the attendant if they had any chang. The attendant replied that he had a small bottle for use during tsog offerings. Jetsun Dragpa Gyaltsen replied that that would be enough, and asked him to bring it, and then not to observe the visitors. After Jetsun Dragpa Gyaltsen blessed the chang and sprinkled it, the visitors were completely satisfied and pleased. 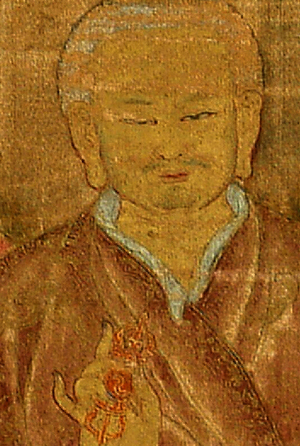 The visitors were divine protectors of the Mongolian emperor known as Namlha Theu. 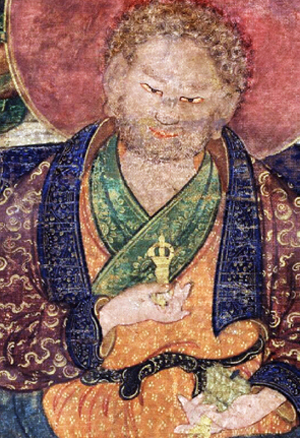 The interpreter was the Tibetan local mountain god Nyenchen Thanglha. When Jetsun Dragpa Gyaltsen was 67, one night during the ninth month, he perceived his root guru, the great lama Sachen Kunga Nyingpo, in a dream surrounded by eight Bodhisattvas. On his right was Hevajra surrounded by eight goddesses. On his left was the Buddha Shakyamuni surrounded by the eight Arhats, such as Godanya and the rest. Sachen Kunga Nyingpo asked, “If you wished to take full ordination, from whom would you take it? If you wished to take a major initiation, from whom would you take it?” Jetsun Dragpa Gyaltsen answered, “If I were to take either full ordination or a major initiation, you are abbot and vajra master combined, and you are the one from whom I would take it.” Sachen Kunga Nyingpo said, “You understand excellently, that is just how it is.” Saying this, Sachen Kunga Nyingpo gave breath to Dragpa Gyaltsen, and that night Dragpa Gyaltsen asked many questions, and dispelled many doubts. Jetsun Dragpa Gyaltsen remained silent and gave no reply, by which the deities saw that Jetsun Dragpa Gyaltsen was willing to depart for Sukavati. They pointed saying, “Behold the design of Sukavati!” Dragpa Gyaltsen looked and beheld the ground entirely made of lapis lazuli, with jeweled trees, and countless other ornaments. One may wonder why Jetsun Dragpa Gyaltsen went to the pure realm of Sukavati, when one recalls that he had earlier prophesied that he would depart for the realm of Golden Light. This is because he made the aspiration, “May I take rebirth in the presence of Sachen Kunga Nyingpo and Loppon Sonam Tsemo,” and through the power of this aspiration, for the time being, he took rebirth in Sukavati. Jetsun Dragpa Gyaltsen said that he perceived many other holy phenomena, but when he awoke, he could not remember them in detail. Then, preceded by the seven-fold prayer, he meditated on the deities of the mandala, after which he told Sakya Pandita, “First I will depart for Sukavati, the pure realm of Amitabha. There, after a little while, I will depart for the pure realm of Golden Light, where in the form of a universal emperor, I will purify my Buddha realm. After that, on the basis of my third body, I aspire to achieve the excellent attainment of mahamudra.” Saying thus, he entered single pointed concentration on profound mantrayana practice. In this way, Jetsun Dragpa Gyaltsen carried the responsibility of throne holder of the Sakya Order for forty-five years, from the age of 26 until the age of 70. Then, in the year of the Male Fire Mouse (1216), on the twelfth day of the second lunar month, he departed for Sukavati.